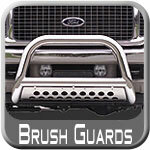 Take a look at our Brush, Bumper and Grill Guards that we offer here at Brandsport.com. Help to protect your bumper or grille from getting chipped or banged up. These protect your vehicle from excessive damage, while in some cases making a statement that you are ready to take on whatever the road has to throw at you, knowing your car is protected along the way. Brandsport.com offers these products from distributors that manufacture their products from the highest quality material to put out a high quality, durable and reliable product that you can trust. Look through our selection of brush, bumper and grill guards that will protect your vehicle, because we know how important your vehicle is to protect and keep looking as good as new.